Ciaron Harkin celebrates his goal against Waterford on Monday night. The tenacious midfield man, nicknamed ‘Jackie’, netted his first goal for the Candy Stripes in the thrilling 3-2 win over Waterford on Monday night. He’s already notched three assists from the opening three games in the SSE Airtricity League and the 22 year-old Creggan lad, who earned another ‘man of the match’ award, opened the scoring with a superb finish into the corner of the net from just outside the box. He made a bursting run to get onto the end of David Parkhouse’s pass before crossing dangerously into the six yard box where Poytnon bundled the ball into his own net. Commenting afterwards Harkin, who Declan Devine claimed would’ve ‘walked on broken glass’ to join City, was delighted to get his first goal for his hometown club but he couldn’t quite recall how it happened. “I forget everything that happened,” he laughed. “All I remember is wrapping my foot around it. “There were a few defenders and the goalkeeper in the way and I just remember seeing the ball hit the back of the net and didn’t know what to do. When asked about his role for the second down goal, he was adamant it went down as an assist. “I passed it off the defender’s leg and into the net so that’s how it’s done isn’t it?,” he laughed. Considering his goalscoring record during his final six months at Coleraine was far from impressive, he reckons his excellent start with Derry is down to the confidence instilled in him by Devine and his assistant coach, Kevin Deery. “During the last six months I had at Coleraine, I never got one assist or one goal and it just shows you the confidence I have now and that’s with the likes of Decky and ‘Deerso’ believing in me. 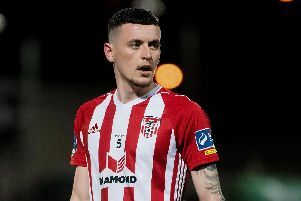 He’s quickly become a fans’ favourite for his workload and desire and he believes that’s simply a reflection on how this Derry City side are set up to play.